We’re doing American Thanksgiving today and although it’s not on my list of usual suspects, I thought I’d try making a pecan pie. Except I have real issues with most pecan pie, which is generally Far Too Sweet (and I have a massive sweet tooth, so if I’m complaining about something being too sweet it’s weird) and doesn’t taste much of pecans. So I went and found a no-corn-syrup recipe, but then I lacked some of the ingredients and anyway, I kind of ended up inventing a pecan pie recipe that Ted thought was the best pecan pie he’d ever had. Toast the pecans in the oven at 350° for 8-10 minutes or until they’re toasted and smell gorgeous. Do not burn! Melt the butter in a small sauce pan. Add the sugars, molasses and water and bring to a low boil (the idea here is just to melt the sugar so it’s not grainy in your pie). Set aside to cool a little while you make your pie crust and the custard mix. Whisk the eggs, flour, milk, and vanilla together. Whisk the sugar mixture in until thoroughly incorporated. Add the pecans and mix in thoroughly, until they’re entirely coated. Pour into a prepared 9″ deep dish pie pan. Bake at 400° for 15 minutes, then reduce heat to 325° and bake for at least another 30 minutes. Mine wasn’t done yet then. I turned the heat down even more so the crust wouldn’t burn & baked for another 15 minutes, until a fork poked into it came out clean. That sounds great! I'll have to try this. Love pecan pie. Pecan pie has always been my favorite, but I also found it too sweet. May have to try this one. Happy Thanksgiving! Sounds interesting. Pecan Pie has always tasted like sugar syrup with a few token nuts to me. Your version definitely sounds much better. Thank you. 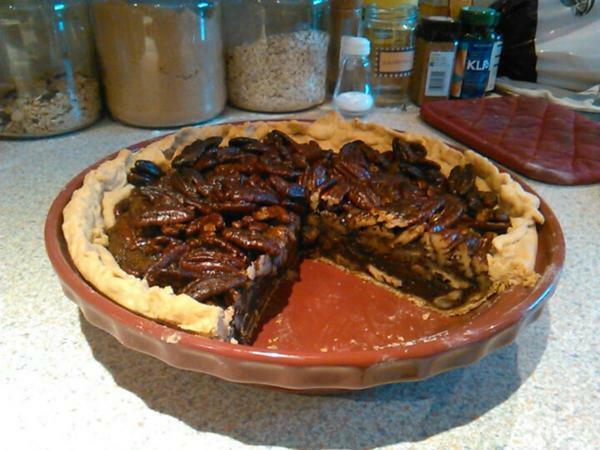 I love pecans, but have always hated pecan pie due to its sugar content. Ted told me about six times yesterday how good it was, just in case I hadn't believed him the first time. Several other people also exclaimed over it, so I think it's a pretty successful recipe. It's *faintly* possible that due to the long cooking time to make sure the centre sets, it's not even necessary to toast the pecans first. I think mine may have ended up JUST on this side of burnt. I now have this in the oven. I'm very excited to see how it turns out! OH SO AM I PLEASE LET ME KNOW!!!! SO GOOD. We weren't going to eat it until today, but couldn't resist trying it last night. Jake thinks it could have been a tad sweeter, but I thought it was perfect. NOM. oh HOORAY! DId you toast the pecans first? Because I concluded afterward (and need to update the recipe to reflect) that given the length of baking time, it probably wasn't necessary. The only pecans I could find were actually already roasted, so I didn't do that step. I also baked it just 40 minutes at 375 (after consulting my Betty Crocker recipe book). I was a little leery about taking it out at that time - my knife came out... not gooey, but buttery. It was pretty dark, though, and the wiggle test was good; it ended up being perfect. I think we didn't let it cool down enough - the pecans wanted to pull out of the filling rather than cut, so it ended up ugly. I'm curious to see how cutting it cold will go. I cut mine cold and it came out poifectly, FWIW. :) I'm so glad you liked it!